What do you know about Studio Two Three? I have to say, the first time someone mentioned it, I didn’t know much (I was referred there when I was trying to save money for a t-shirt order). I was told classes were held there and you could learn how to screen print a t-shirt or how to use Photoshop for some DIY savings. That was probably two years ago, and since then I’ve learned the place is a whole lot more, but it is kind of hard to define. Ashley Hawkins, the studio Executive Director and founding member agrees. 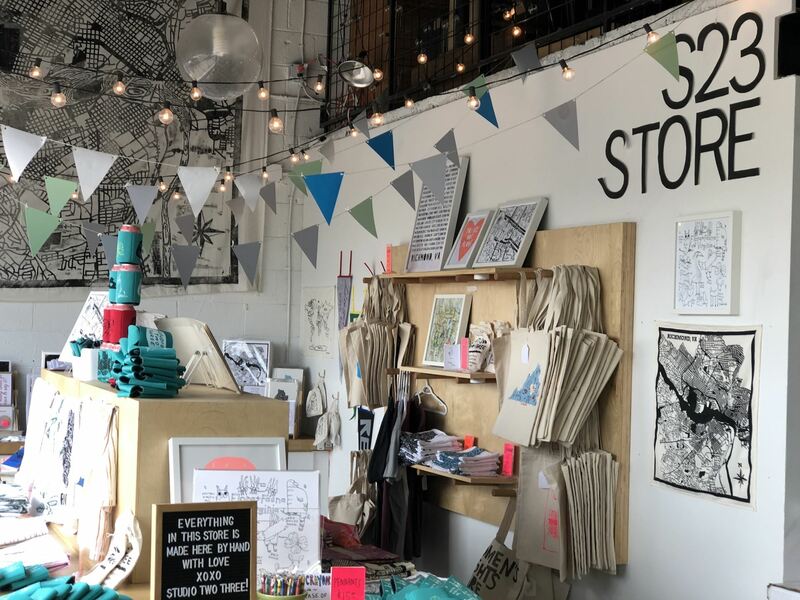 Studio Two Three is a 501c3 non-profit founded by Hawkins and three friends: Emily Gannon, Tyler Dawkins and Sarah Moore, who’s now part owner in Mean Bird with her husband, Mike. Gannon and Dawkins have also embarked on their own endeavors but the group first came together in a 600sf space in Richmond’s Plant Zero; Studio number 23, to be exact. And their plan was simple, to build something like what they had back in art school. Hawkins says she had access to all kinds of expensive equipment and resources, along with round-the-clock access to it, but there was nothing really like that for them post-graduation. So, that was the group’s goal: To help people stay in Richmond and create lively careers in the arts, or supplement their income and keep their love of art going. The following year the group moved into a space on W. Main Street in the Fan District and called themselves Studio Two Three, a nod to their tiny beginnings. They remained in the space until 2014, developing classes and adding more programs but it became clear – they not only needed to offer more, they needed more space. Hawkins says she actually snuck into the current Scott’s Addition home of Studio Two Three, while some demo work was underway. Hawkins says they needed a “vamped up” warehouse cool enough for a gallery and sound enough for heavy, expensive equipment but wasn’t so fussy you couldn’t spill ink on the floor. It also needed good visibility, parking and access for walking or biking to it. 3300 W. Clay was ideal. Monument Construction, which owns the building, saw the vision and agreed to lease the space. After launching a capital campaign, Studio Two Three moved into Scott’s Addition in 2015 and just two and a half years later expanded and took over an additional adjacent space now used to host events, classes, nonprofit groups and more. The group signed a 13-year lease with a five-year renewal option. The total space is now 13,000sf. In 2017, the studio also purchased an old ice cream truck and transformed it into Studio Two Three To-Go, allowing them to take their show on the road to festivals, schools and parties. An 11-member board helps Hawkins run the whole shebang. It’s a two-year term, and board members can serve up to two consecutive terms. We know you’re asking, what does it cost to be a member of Studio Two Three? Private membership, which may include a loft space/office (there’s a waitlist) is $250 a month and includes 24-7 access to all the building, equipment, computer lab, kitchen space etc. You can also purchase a communal studio membership for $95 a month (educators and students enjoy a $50/month rate) and will be given 24/7 access to the studio, a flat file, cubby space, and use of all the building’s equipment. If you just want access to the dark room to print photos it’s $50 for public access and $75 for private access. All members must be 18 and over and right now there are over 100 members. I should also mention there are high school and college internships available and special pricing for students. While you can rent Studio Two Three for large events, Hawkins and her team will also host you for something smaller, like a teambuilding event where for $35 a head, you can bring your employees in for a couple of hours to make art that they get to take home with them. Like oh, say a shirt, with your brand name on it. How’s that for bang for your buck? Even in the non-profit world, running a business is hard, but Hawkins says the stories that come out of Studio Two Three make it worth it and knowing that she’s helping make people’s lives better and more fulfilling has paid off in dividends. Want to visit Studio Two Three? Want to give to Studio Two Three? 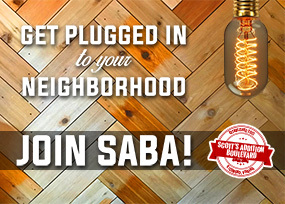 The Scott’s Addition Boulevard Association is an eclectic group of businesses & residents all working to make the Scott’s Addition neighborhood one of the best communities in RVA.